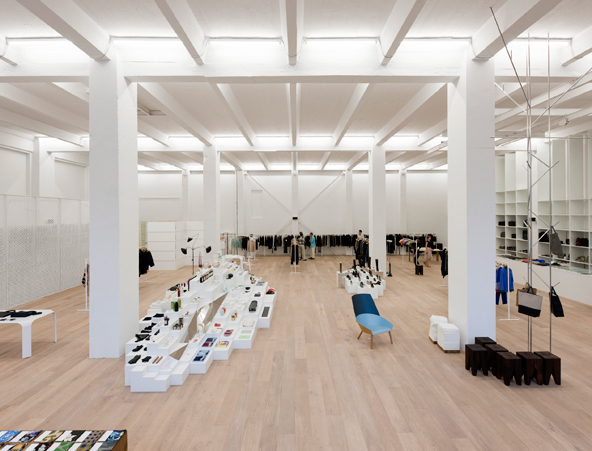 Murkudis may have helped pioneer the Mitte retail scene when he began selling Margiela and Yohji from three minimalist storefronts inside a courtyard off Münzstrasse in the early 2000s, but with a few notable exceptions — the recently opened Gestalten bookshop, the Kunstwerke contemporary art museum — it’s no longer the place that in-the-know young people go to hang out and discover things. It’s the place they go when they need something from American Apparel. With the move to Potsdamer Strasse, where high-profile galleries like Blain/Southern and Arndt increasingly reside but no clothing merchant has yet dared to venture, Murkudis is essentially taking out an insurance plan on his own cachet, in this case one with a 15-year lease attached. By the time it expires he’ll be 64, and if all goes as he expects, the neighborhood will have risen up to meet him. In the meantime, he’s traded foot traffic — which he claims is dispensable, considering the average passer-by can’t afford his wares — in exchange for a breathtaking, nearly-11,000-square-foot selling floor inside a former newspaper printing press, with a shop-in-shop hawking Mykita sunglasses and an entire sunken level devoted to furniture by the German brand e15. The local architects Pierre Jorge Gonzalez and Judith Haase outfitted the whitewashed interior with the same kind of low topographical landscape they invented for AM2 and AM3, but this time it not only complements the minimalist tendencies of their client but exaggerates the disparity between the massive light-filled rooms and the small handful of racks scattered at their perimeters. It’s a nod to the ridiculous luxury of space that you expect to see only in Berlin, but that even the Murkudises of the world must go to increasingly great lengths to find. CLICK HERE to read the original story on T Magazine’s website.